All the latest information on Panasonic’s upcoming full-frame mirrorless cameras. Panasonic announced its long-rumored new full-frame mirrorless cameras at Photokina 2018, but official details have remained very closely guarded - until now. At CES 2019 it was announced that the Panasonic S1R and Panasonic S1 will be available from March 2019, with HDR and High Resolution modes coming at launch and we now know everything there is to know about the both cameras. UPDATE: Digital Camera World is among the first in the world to get a hands on: Panasonic S1R review and hands on: Panasonic S1 review. Click on the links to check out our thoughts about two of the most exciting mirrorless cameras around right now. Now that we have had hands on with the two cameras, we’ve assembled everything we know about the new Panasonic Lumix S series, its key features, lenses and those all-important prices. Panasonic has launched two cameras as part of its new Lumix S series, with different resolutions, user types and price points. There are two new cameras with two different sensors. The top of the range Lumix S1R has a 47-megapixel sensor, while the cheaper Lumix S has a 24-megapixel sensor. The higher-resolution S1R is designed to appeal to professional stills photographers. If you want to learn more about the Panasonic Lumix S1R then we have a detailed breakdown of all its specs here. 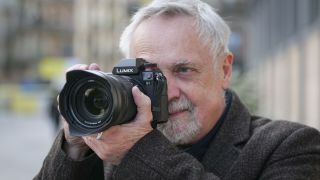 Panasonic seems to be adopting the same strategy as Sony and Nikon, so the Lumix S1 will bear the same relationship to the S1R as the Nikon Z6 does to the Nikon Z7, and the Sony A7 III does to the A7R III. The S1R has more resolution, but the S1 is better adapted to video. We have a more detailed look at the Panasonic Lumix S1 specs here. The new cameras offer 4K video capture, just like their full-frame rivals from Canon, Sony and Nikon, but they will offer frame rates of up to 60/50p, which Panasonic claims is a world first for full frame cameras. The S1R and S1 will offer a combination of in-body image stabilisation (IBIS) and lens-based optical stabilisation. Panasonic has done this before with its Micro Four Thirds cameras, like the Lumix G9, as has Olympus with its OM-D E-M1 II and 12-100mm f/4 lens pairing. This offers more shake compensation than either system on its own. Panasonic is sticking with its DFD (Depth from Defocus) contrast-based autofocus system, despite all its rivals swapping to on-sensor phase detection. Panasonic’s DFD system has proved very fast in its Micro Four Thirds cameras, however, rivalling phase detection/hybrid systems for speed. Nikon has come in for a great deal of criticism for offer just a single (XQD) card slot on its Z 6 and Z 7. The Panasonic Lumix S1 and S1R, however, will have two card slots – one XQD and one SD. High-speed memory card formats are crucial for high-resolution 4K cameras. The SD card slot will be UHS-II compatible. Panasonic has not adopted the regular flip-out rear screen seen on some of its Micro Four Thirds cameras, opting instead for an unusual ‘tri-axial’ design that allows a sideways tilt as well as a vertical tilt. This should get round the issue of taking shots with the camera held vertically (a problem for cameras with a simple tilt mechanism) while keeping the screen closer to the optical axis of the camera for better handling. A similar design works well on the Fujifilm X-T3. Panasonic hasn’t stated the resolution of the electronic viewfinder fitted to the S1R and S1, but has said it is “higher” than those on the Nikon Z7 and Canon EOS R. EVFs now approach optical viewfinders for clarity, but Panasonic’s EVF will also need a high refresh rate to avoid lag or ‘smearing’ when following fast-moving subjects. Externally, the two new cameras appear identical, with the same dimensions, controls and layout. Panasonic claims the S1R has “100%” weather sealing, an “extremely” durable shutter and is designed to offer experienced photographers extensive external controls. Hopefully, the S1 will share the same weatherproofing. Photokina 2018 also saw the announcement of the new L mount alliance, which should give Panasonic’s full frame mirrorless lens range a good start. Panasonic did not attempt to launch yet another proprietary lens mount. Instead, it announced an alliance with Leica and Sigma whereby it would use Leica’s established L mount, as used on the Leica SL, and presumably benefit in due course from Sigma’s large and expanding mirrorless lens line-up. Panasonic has announced three new lenses for the Lumix S range. They are a 24-105mm f/4 standard zoom lens, a 50mm f/1.4 fast prime and a 70-200mm f/4 constant aperture telephoto zoom. This lens is likely to be the ‘standard zoom’ for the Lumix S1 and S1R. It offers a offers a constant f/4 maximum aperture and an extended 24-105mm focal range. This is a a fast 50mm prime and is part of the Lumix S Pro series. It boasts an 11-bladed iris (aperture) for briliant bokeh, and consists of 13 elements in 11 groups. This is an f/4 lens rather than a 70-200mm f/2.8 which has been pitched at sports, action, wildlife and even portrait photography. It has 23 elements in 17 groups, including a single aspherical lens and three extra-low dispersion lenses. Panasonic says seven further lenses for the Lumix S1R and S1 will be launched by 2020, bringing the total up to ten. There’s no news yet on what these lenses might be (they were shown only as silhouettes at the Panasonic presentation), but it seems likely that Sigma’s involvement will move things along quickly. Sigma has promised 14 lenses for the L-mount in 2019 (essentially the same line-up of lenses is now offers for the Sony E-mount). It will also provide converters for Canon EF and Sigma SA mount lenses. Leica already has a range of L-mount lenses available. The Panasonic Lumix SR1 release date, UK wise, is 18 March - but is now available for pre-order. The Panasonic Lumix S1 price, UK wise, is £2,199.99/$2,499 (body only) and £2,999.99 /$3,399 with a 24-105mm lens. The Panasonic Lumix S1 release date is 18 March. The Panasonic Lumix SR1 price is: £3,399.99/$3,699 (body only) and £4,199.99 / $4,599 with the 24-105mm lens. This means the Lumix S1R is the same price as the Nikon Z7 (£3,400/$3,400) and higher than the Sony A7R III (£2,900/$2,800). Panasonic has re-affirmed its commitment to its smaller Micro Four Thirds format, seeing its two camera ranges as having two very different audiences. This will be good news for those who’ve already invested in G series cameras and lenses, and indeed Olympus fans worried that Panasonic’s full frame announcement might spell the beginning of the end for the Micro Four Thirds format. To cater for the new type of professional user its S1R and S1 are aimed at, Panasonic is launching a preferential Lumix Pro program along the same lines as those operated by Canon, Nikon and Sony. This should give professional photographers confidence that they will get priority support when they need it.